According to the Insulation Institute, fully 90 percent of today’s American homes are underinsulated. That’s really too bad, because insulating your house is one of the greenest moves you can make. Effective insulation keeps in heated or cooled air – depending on the season – thereby lowering your HVAC energy consumption, your utility bills, and your carbon footprint. Often, though, homeowners simply don’t know enough about insulation: where to install it and which type is best. That’s why we’re presenting a primer on insulation ratings of common materials, and the best locations to install them in your home. R-value is the standard measurement when you compare the insulation ratings of various materials. The R-value indicates the resistance to heat transfer of a given type of insulation. The more effective the insulation material is, the greater its R-value will be. Optimal R-value when insulating your home will depend on which part of the country you live in – obviously, homes in states with harsh winters require higher insulation ratings to keep out the cold, as per this Energy Star map of Recommended Home Insulation R– Values. . There are numerous home insulation materials available. To compare their insulating ability, look at each one’s R-value per inch of thickness. However, note that R-values do not necessarily increase in direct proportion to increases in thickness, due to compaction. Insulation ratings also tend to change over time, with improvements in materials. Batts and blankets made out of fiberglass or rock wool provide an R-value of 3.1-4.0. Blown-in loose fill made of cellulose, fiberglass, or rock wool fibers or pellets has an R-value of 2.4-4.0. Rigid foam (extruded polystyrene, expanded polystyrene, polyurethane, polyisocyanrate) has an R-value of 3.5-7.5. 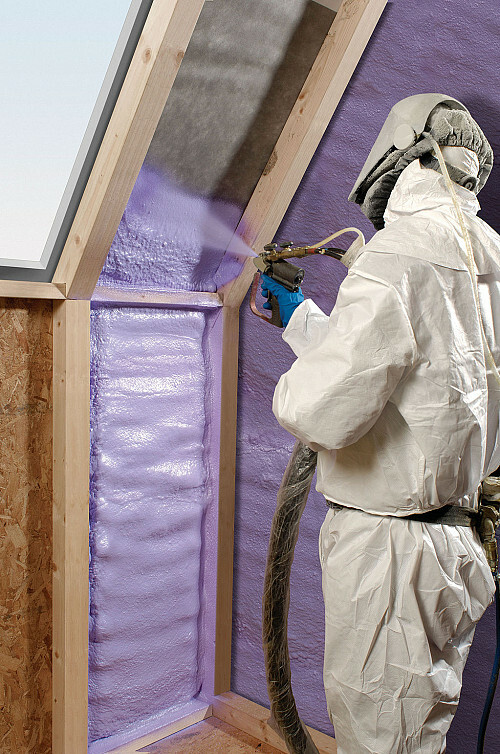 Spray foam manufactured from polyurethane or polyicynene offers an R-value of 3.6-7.0. Radiant barrier of reflective material (generally aluminum foil is used as attic insulation, mainly in warm regions to reduce heat gain and cooling costs. It is not usually rated for R-value. Floor of unfinished attic. In an unfinished attic, insulate the floor to form a barrier which will minimize cold air (or hot, in summer) getting into your living space below. Don’t forget t insulation for the attic access door. Finished attic walls and ceiling. If you use your attic as a bedroom, home office, etc., apply insulation to the ceiling, between the studs of interior knee walls, and outside between the studs and rafters of the walls and roof. Floors atop cold areas. Similarly, insulate your floor above an unfinished cellar or crawl space. Ditto for any living quarters over your unheated garage. HVAC ducts. Ductwork in unconditioned areas of your home should be sealed and insulated to minimize loss of air heated or cooled by your HVAC system. Insulate the plenum, as well. Check your local building code to find out where and how much insulation is required. If you plan to do the insulation yourself, batts are easiest to work with, as long as your roof joists and wall studs are spaced according to standard measurements. Otherwise you’ll have to cut the batts to fit. For other types of insulation, which are more complicated to install, hiring a professional is your best bet. To keep out moisture, look for insulation materials equipped with a vapor barrier. Remember to minimize air leakage by weatherstripping around doors and windows, installing thermal drapes, and plug cracks or gaps with caulk. Consider dry walling over an exceptionally cold wall to add a layer of protection.